Wednesday night and time for another Tweet tasting! 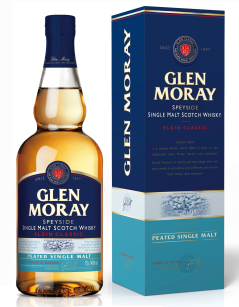 This time we’ve got five drams lined up from that quiet gem of Speyside, Glen Moray. The distillery’s been in business since 1897 and produces a fairly classic Speyside style of spirit but without heavy sherry maturation to detract from the light, fruity distillate. All standard releases are matured full term in Bourbon casks and generally bottled at 40% ABV with chill filtering and caramel colouring. 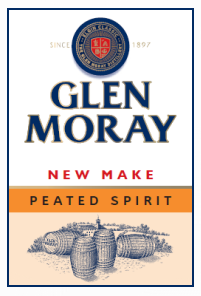 We’ve got the Classic, Peated Classic, and the Port Cask Finish as well as peated and unpeated new make spirit. It’s very rare to be able to try new make so this really is a pleasure. All the drams we’re trying are on sale in the UK (except the new makes, of course) for £25 or less per bottle so the distillery core range is really aimed at the low budget end of the market. Nose: Very, very creamy. Brandy butter and icing sugar. Dried banana chips in thick custard. Juicy sultanas, with a good waft of grappa. Bubblegum. Finish: Tingly and numbing, with the strength. But the fruit notes linger and settle nicely. Stewed rhubarb crumble at the end. This definitely needs the water adding, but once you bring it down to around the 50% mark it becomes very drinkable with a lot of those lovely Ester-rich sweet shop flavours you expect from Speyside spirit. Nose: Hard fruit candy. Barley sugar sweets. White wine. Apple blossom. Juicy fruit gum. Pineapple cube sweets and fruit salads. Green apples. Palate: Very clean and light. Oodles of vanilla bean. Fermented apples, again. Sweet cider. Malty barley and honey. Finish: Middle length and smooth. Slightly peppery with lots of oak. I have to confess, chill filtered whisky at 40% is usually a “Thanks, but no thanks” from me, being more of a “straight from the cask” kind of whisky drinker. However, for the price (around the £20 mark in supermarkets), this actually delivers a lot of very nice fruity and barley notes and is a perfect easy-going sipping dram. You can pick this up for £21.95 at Master Of Malt or a similar price in your local supermarket. Nose: Cherry and lime skins. Muscavado sugar and ripe banana. Egg custard tarts and Jammy Dodgers. Marzipan-rich wedding cake. Calvados and blackberries. Yankee candle. Palate: Oily and soft on the tongue. Jammy with red wine gums. Soft toffee leading to oaky red wine notes. Tart and tangy. Finish: Oaky red wine lingers – reminiscent of Beaujolais. Here’s a port finish that definitely complements the spirit. It gives it a heavier, plummier profile but without being overpowering. Well worth a taste if you like your lighter style red wine flavours. 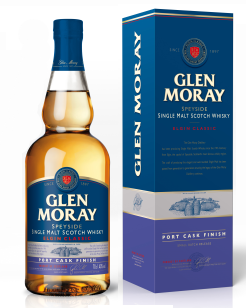 You can pick this up for £26.95 on Master Of Malt, or cheaper still at your local supermarket. Keep an eye out for the Chardonnay finish as well. Nose: Salty and starchy – like a packet of ready salted crisps. Strong breathmints. Smoky cured ham. Sourdough toasting over oily barbecue charcoal. Palate: Holy moly that’s hot! Needs water. It’s smoky but also thick, sweet and syrupy. More peardrop but with coal tar and wood ash. American cream soda. More grappa again. A hint of wet dog, but that’s not a bad thing. Mossy. Finish: Drying and ashy – a little chewy, to the point where you feel you could pick bits of peat from out of your teeth. This is really very nice indeed. You need water, of course, but it’s packed with barbecued bread flavours and an oily, sticky peat that’s dry and wood-smoky, rather than medicinal. Nose: Wet paint, marker pens and coal dust. Salty sea air and fresh straw. A little lemon drizzle cake. A bit more of that ready-salted crisp smell from the new make. Palate: Pear drops and salted caramel with a zingy lemon meringue kick. Cardomoms and liqourice. Calmer than the new make, with more fruity and ester-rich aromas making their way through the peat bog. I’d say it has a lot in common with Caol Ila – that lightly peated yet fruity flavour, except very firmly from Speyside and not Islay. This seems to just be available on the distillery website’s shop – a bargain at £25! When drinking whisky, it’s important to keep an open mind. It’s the common wisdom among whisky-philes to steer clear of drams that are released with chill-filtering, added colouring, and no age statement. 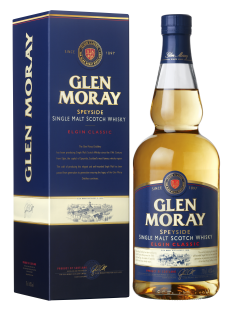 I’d normally do the same, but I was curious about Glen Moray having been lucky enough to try a 1960 vintage at a whisky festival – a truly beautiful dram that was. And I’m very glad I have. These whiskies, for the price, represent very good value for money. I’d recommend them as good introductory drams for whisky newbies, or as an easy sipping weeknight dram. Thanks very much to Steve Rush and the folks at the Glen Moray distillery.